Melting Pot KC, one of the resident theater companies based at the Just Off Broadway Theatre, kicks off its spring season with “The Frowning Vajayjays of Shady Pines,” a new work by Kansas City playwright Vicki Vodrey. Vodrey has established herself as a writer to watch by following a seemingly simple pattern: Introduce a play at the KC Fringe Festival and then take it to the Midtown International Theatre Festival in New York. She did that with “Thank You Notes: Headed to Heaven With Flat Jimmy Fallon” in 2012 and “Hanky Panky” in 2011. Vanessa Severo was named outstanding lead actress in a play for the New York production of “Thank You Notes,” which was nominated for outstanding new script for full production. Steven Eubank also was nominated for his direction. Vodrey said she intended to produce a shorter version of “Vajayjays” at the fringe fest this year. But Harvey Williams, artistic director of Melting Pot, heard her read the script at a monthly gathering of playwrights at the Metropolitan Ensemble Theatre and immediately asked her to forgo the fringe fest and let him produce the play at Just Off Broadway. The initial version, Vodrey said, was only about 20 minutes long and depicted two elderly women, one white, the other African-American. 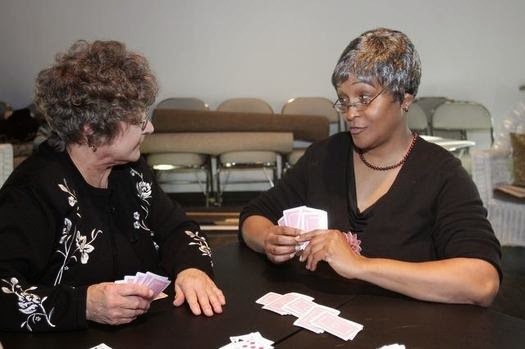 The resulting play centers on a group of women in an Alabama retirement home. Vodrey said it runs about 90 minutes and can be staged with or without an intermission. Williams said the play fits perfectly with Melting Pot’s mission of depicting people from diverse walks of life in terms of ethnicity, gender and age. Williams is directing the show, which features Nancy Marcy, Sherri Roulette-Mosley, Petra Allen, Cindy Siefers and Jeff Smith. Vodrey, meanwhile, will have a different show in KC Fringe Festival this year, and she has decided to enter “Thank You Notes” in the New York International Fringe Festival. “The Frowning Vajayjays of Shady Pines” begins performances tonight and runs through April 6 at Just Off Broadway Theatre, 3051 Central St. in Penn Valley Park. For more information, call 816-226-8087 or 816-914-1520 or go to KCMeltingPot.com.